Habitat: In the East, wooded edges of swamps and rivers, moist deciduous or mixed woodlands, bottomlands. Prefers habitat near open areas for hunting. Requires tall trees for nesting. Diet: Small mammals such as voles, moles, mice, and squirrels; also, some rabbits; snakes, toads, frogs, lizards, crayfish, large insects, small birds. 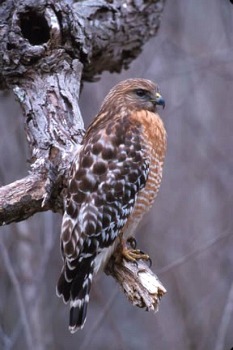 The Red-shouldered Hawk usually builds its nest in the fork of the main trunk of a tree or near where a large branch juts out from the trunk. This bird prefers to nest near swampy areas or other sources of water. This raptor is active during the day (diurnal) and rests at night. It often shares habitat with the Barred Owl, which is mostly active during the night (nocturnal). Since they both hunt at different times of the day, there is less likelihood for conflict. The Red-shouldered Hawk will sometimes work together with crows to chase away Great-horned Owls or Red-tailed Hawks, both of which prey on the eggs and chicks of this hawk. 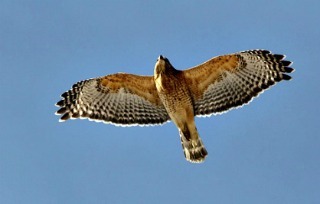 There are five subspecies of the Red-shouldered Hawk, mostly separated by geographic location: Eastern (lineatus), Southeastern (alleni), Texas (texanus), South Florida (extimus), and California (elegans). Each subspecies has somewhat different coloring, with the California species having the brightest rufous coloring and the Florida subspecies being the palest.